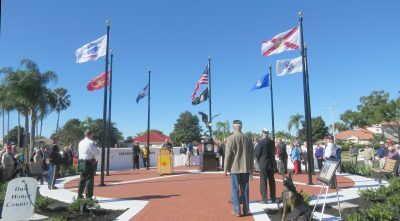 The dedication program included “All Flags Raised” to our “National Anthem,” a gun salute and “Taps” by Sgt. Walter P. Ryan, Detachment 1226, Marine Corps League, Riverview. 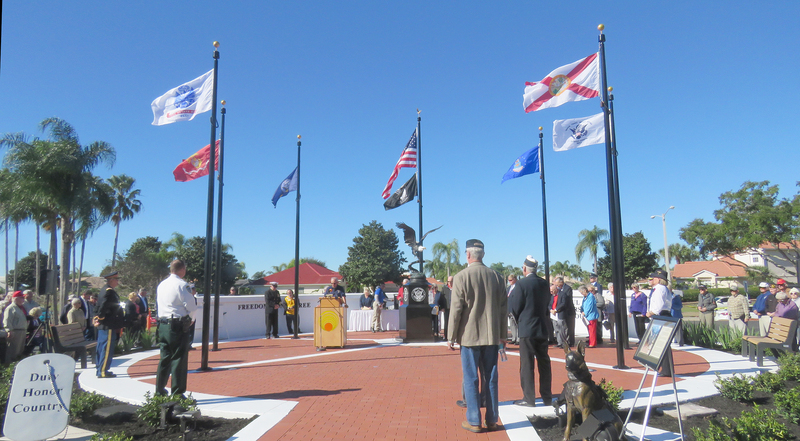 January 10 was a landmark day when the new Veterans Memorial in Sun City Center was dedicated. 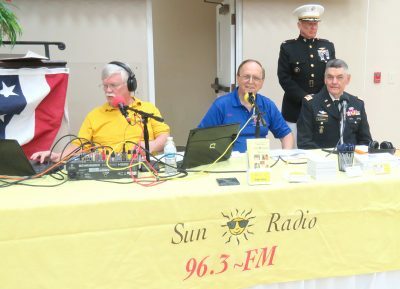 It is the community’s tribute to former, current and future Sun City Center veterans of the U.S. military—Army, Marines, Navy, Air Force, Coast Guard and World War II Merchant Marines. About 650 attended the program in the SCC Community Hall and the ribbon-cutting ceremony that followed at the memorial site outside. 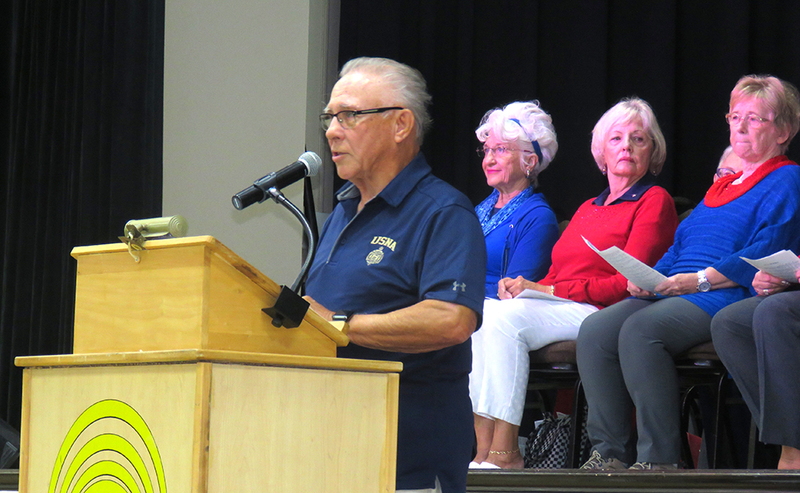 Veterans Memorial Committee Chair Walt Cawein was passionate as he talked about community support throughout various phases of the project. Each element of the event demonstrated an appreciation for the sacrifices of our nation’s military men and women and for the community support that made the memorial possible. It was evident in the remarks of every speaker and in the patriotic music of the United Methodist Church of SCC’s choir and Salvina Tannenholz’ rousing renditions of “God Bless the USA” and “America the Beautiful.” All major roles in the program were filled by retired military officers: Master of Ceremonies — Benny Blackshire (Army); Invocation — Rev. Julian Graham (Army); Pledge of Allegiance — Gordon Bassett (Air Force). Speakers included Veterans Memorial Committee Chair Walt Cawein (Air Force) and Keynote Speaker Mike Davis (Marines). 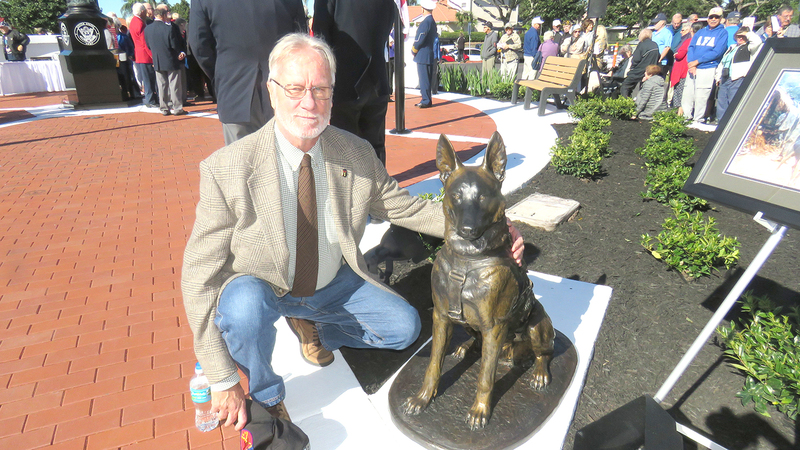 SCC resident and U.S. Army veteran Ted Van Aulen was the handler of Warlock, the war dog which inspired the sculpture in the Veterans Memorial. A 1969 photo of the two and a story about Warlock’s entry into the military is displayed. The memorial fills the space inside the circular driveway of the Community Association’s South Campus facility, 1910 S. Pebble Beach Blvd. It includes seven flags — United States, Florida and each of the five service flags, a 6-foot eagle mounted on black granite, a Belgian Malinois war dog sculpture, a dog tag sculpture and benches. The foundation consists of 8,000 4 inch by 8 inch and 8 inch by 8 inch bricks, with many engraved with names of veterans and area individuals and organizations who supported the project. Asked if engraved bricks can still be purchased, Cawein responded with a quick, “Yes, definitely. It’s an ongoing project. We will simply replace a plain brick with the engraved brick.” An order form can be found at the website of Sun City Center Charitable Foundation (www.charitablefoundationscc.org). Cawein invites anyone needing help or more information to call him at 813-340-0533 or preferably email him at waltcawein@gmail.com. The dedication’s live broadcast by Sun Radio WSCQ 96.3 FM included interviews with program participants. From left, Vern Hendricks, Bill Hodges, keynote speaker Mike Davis (standing), and Master of Ceremonies Benny Blackshire.